South Florida and the Florida Keys are close enough to the climate in the tropical areas of the world to allow gardeners the opportunity to grow their own tropical fruit trees. Gardeners in North and Central Florida have a more limited choice. Tropical fruit trees do not stand up to frost and need to be protected in the event one is expected. Papaya (Carica papaya), also known as papaw, fruta bomba, lechosa, and melon tree, is native to the lowland tropics of South America and is hardy in South Florida and the Florida Keys. The plant will grow in Central and Northern Florida, but the season is too short for fruit production. The tree grows from 6 to 20 feet tall with leaves that measure up to 24 inches across growing on stems that grow to 24 inches long at the top of the plant. The cream-white flowers bloom all year long, sharing the tree with the smooth-skinned yellow, orange or rose fruit growing in clusters and reaching up to 20 lbs. Select a tree that has both male and female flowers unless you are planning to have more than one tree. 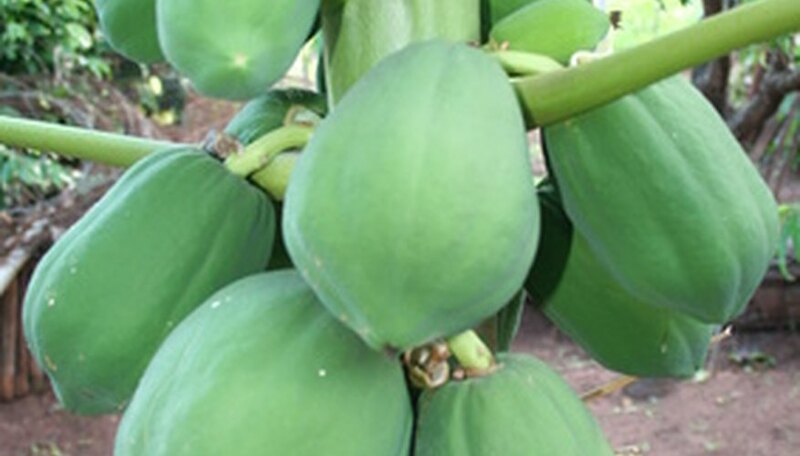 Plant the papaya in full sun and a moist soil. Both the ripe fruit and the seeds are edible. Unripe fruit is toxic if eaten raw. Tamarind (Tamarindus indica) is a member of the bean family that is found in the tropical areas around the world. The tree is hardy in South Florida and the Florida Keys. The plant grows up to 90 feet tall with a short trunk, drooping branches and an umbrella-shaped crown about as wide as the tree is tall. The tree produces compound leaves about 10 inches long made up of 10 to 18 pairs of oblong-shaped leaflets growing to about 1 inch long. The pale-yellow flowers measure 1 inch across, are accented with purple or red veins and grow in small clusters. The fruit is a cinnamon-brown seed pod with a velvet feel that grows from 2 to 6 inches long. Plant tamarind in full sun and a moist soil. The pulp is used to make beverages, curries, chutneys and sauces. Avocado (Persea Americana) is also known as alligator pear, aguacate and palta and is native to Mexico, Guatemala and the West Indies. The tree is hardy in all of Florida including the Florida Keys. The tree is an evergreen that grows to 60 feet tall and produces elliptical-shaped leaves that grow from 4 to 8 inches long and small green flowers. The fruit comes either round or pear-shaped and in a variety of sizes weighing up to 2 lbs. Plant avocados in full sun and a moist, well-drained soil that is allowed to go dry between waterings. Pick avocados before they ripen and allow to ripen off the tree for the best flavor and quality.